DO YOU NEED A CRUTCH? I DO NOT USUALLY USE A HAND REST/CRUTCH! But Just Because I Don’t- Doesn’t Mean that You Shouldn’t! Here are My Reasons FOR USING THE HAND REST! WHAT IS CORRECT HAND POSTURE??? Resting the Right Thumb Just Above the B-FLAT and PANCAKE KEYS. Some bassoonists like to rest their Thumb ON THE WOOD OF THE BASSOON ABOVE THE B-Flat Key, Slowing their Technique with Extra Movement. Some teachers even tape a THUMB TACK to the RESTING SPOT to DETER RESTING THE THUMB ABOVE THE KEYS. I Find Double Sided Sticky Tape or a Loop of Tape USUALLY Does the Trick. 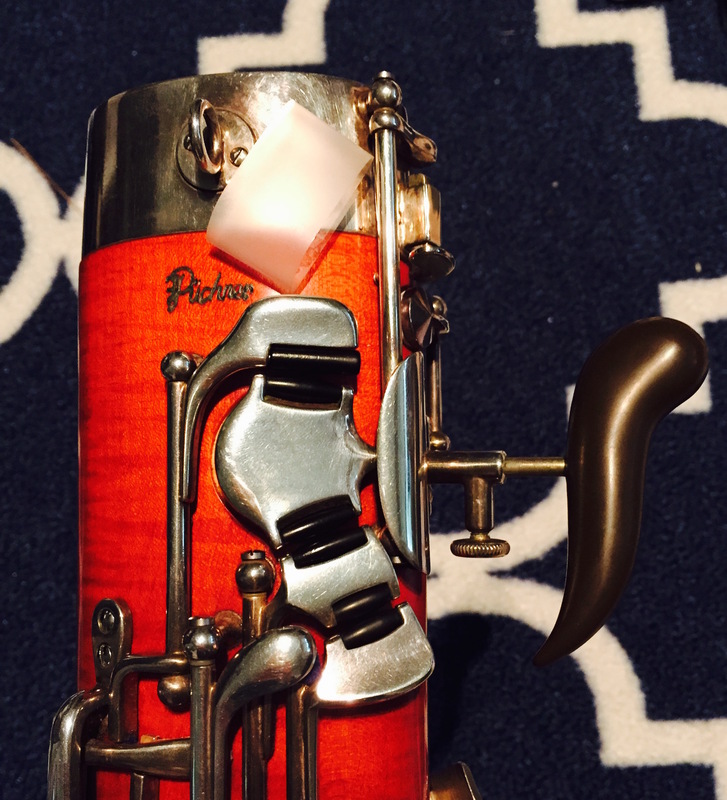 A Student Sticks each Time The Thumb Goes Astray… But the Tape MUST BE Replaced Regularly as The STICKY will WEARS OFF. Picture of A Loop of Tape on the Boot Joint Where the Thumb Can Accidentally Rest. That’s where some teachers attach a Thumb Tack. The Hand Rest HELPS Bassoonists with Large Hands. It Creates More Space Between the Hand and the Bassoon. Allowing for Better Hand Posture with Little Effort! The Hand Rest Works Can Work as An Anchor. The Bassoon is Always Angled Across the Body. When Standing the Bulk of the Weight is Usually Mostly on the LEFT ARM. By Placing the Hand Rest Under the Right Hand, it can Give the Bassoonist More Flexibility in Balancing the Bassoon Weight. And in Case You are Looking for MORE- Here’s a Tutorial on the Hand Rest OR Crutch! Next PostNEW LIGHTS, CAMERA and TRIPOD!